But here's what I'm interested in today: Zotero has added a SIMILE Timeline feature. You can read about it here. (Thanks, JBJ!) The timeline is fairly simple: it is designed to show you when the materials in your collection were either published (publication date), added (when you first added them to your Zotero collection), or modified (the date you last updated the entry). 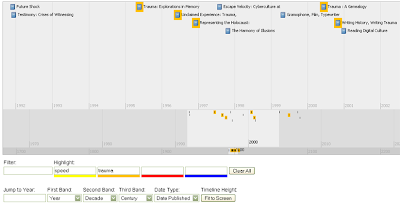 You can also highlight different items based on words in their title, filter entries by a keyword, just to a particular year on the timeline, or adjust the units of the three timeline bands. The timeline appears in your browser, which is where Zotero lives. It does not at the moment, however, come with a stable URL which would allow you to share it with others. Instead, all the information (as is the case with all of Zotero) lives on your computer. Perhaps this will change when the new version of Zotero emerges and citations begin living on a web server rather than a small file on your hard drive. Something else that I would like to see is the ability to highlight items based on terms beyond title words. At the moment, if I have a term in the "notes" field for a book, the book will not be highlighted when I use that term in one of the timeline's highlight boxes. Since terms that I associate with articles or books are not always (or even frequently) part of their title, the highlighting feature doesn't really serve the purpose that I think one would want for it: to show relationships between objects that are not immediately obvious. Then again, one might ask whether having a timeline of your bibliography is the best place to reveal these relationships. Zotero has a "tag" feature, and if you've been diligent in assigning them, you can sort your collection within Zotero by those tags, without dealing with the timeline. A bigger question is about the whole implementation of a timeline in Zotero: does one really needs to visualize bibliographic data by date? I don't think that it's something that I will be using frequently. But then again, my work is not as date sensitive as that of people in the sciences or social sciences. My timeline works best when viewed by years and decades rather than months. Others would likely benefit from seeing how sources follow one another. The larger benefit is something that I've been interested in throughout this year: the increasing ability to visualize data that is made possible by web 2.0 tools. I can't prove to you that having your bibliography in a timeline will lead to new ways to think about the sources or the datasets that they contain. But there's no reason to think that having this option wouldn't be of benefit. Just like Moretti's Graphs, Maps, Trees, you don't know what you can learn from a quantitative model (or quantitative-esque as far as Zotero goes) until you build it and spend some time looking at it. Perhaps if I added every source from Discourse Networks, I would learn something new about the shift in read/write technologies from 1800 to 1900. Or perhaps I could see where Kittler perhaps missed a crucial decade's worth of sources. In any case, something like the Zotero timeline is a tool to accomplish this. P.S. As long as I'm passing along suggestions, it would be really amazing to see Zotero use SIMILE's Exhibit script in conjunction with Timeline, which would potentially allow the visualization of data to incorporate relationships between sources, their notes, tags, and more. Despite my best efforts, I'm frequently behind the curve on web tools and platforms. Today I came across two different tools that essentially allow you to roll your own social network: ning and grou.ps. The idea is that rather than using a forum or wiki architecture, which are, respectively, either painful limited in what they can do or more complicated than the average user can handle, you have a WYSIWYG editor to compile your own Web 2.0 community. To what extent are these something more than just a prettier forum? I'm not really sure yet. I'm thinking I'll have to play with these over the next few weeks. Anyone else want to play along? Wayne recently sent me a link to K-12 Technology Specialist Steve Hargadon's blog. A post at the beginning of March (sorry for being slow) suggests that Web 2.0 is the future of education. Hargadon is nothing if not effusive about his subject. Several commenters question the reality of his vision, in particular whether it will be possible to educate educators to make use of Web 2.0 tools when they are already busy and/or comfortable with their current levels of technology. I think they are right to make these observations, but let me just draw on two or three points of Hargadon's that I find interesting. The ease of publishing in a Web 2.0 environment means that we are faced with increasing amounts of information. Hargadon's proposed remedy? ...Produce more content. Because it is in the act of our becoming a creator that our relationship with content changes, and we become more engaged and more capable at the same time. In a world of overwhelming content, we must swim with the current. This is a noble idea, but I'm not sure that it holds water. My writing this blog doesn't necessarily mean that I have a better idea of what information is out there. I extract things that I come across that are useful and share my observations on what I've been working on. But that doesn't help me manage everything I don't have time for. Perhaps what it does, however, is give me a place to articulate what I find to be valuable. Pointing it out to others. But does this all boil down to just another Digg-like application? Where things get filtered out by mass aggregation? That doesn't seem all that different from the systems we already have in place. The end product of the course will be a collaborative volume on the history of dieting which has been commissioned by a major publisher. This course will demand real research, real writing, and will have a real product. The English Department has been making grants available to faculty members and grad students who want to co-author an article. Although these endeavors don't necessarily employ Web 2.0 technologies, they do capture the Web 2.0 mentality. What's more, they provide a possibile answer to the comments to Hargadon's original post who wonder how they can get teachers to learn new technologies: offer a concrete reward that has nothing to do with improving one's teaching. So. I'm interested in hearing what others think about these points. Do social networking applications change the dynamic in a classroom, regardless of whether the class is using them? Do students coming into college today expect something different than they did when I arrived as a freshmen in 1995? How can we collaborate with our students? So although I've been dusting off my Google Earth skills a bit, this is going to go in a completely different direction. Last week, Shawn McCauley wrote about a new mindmapping tool--bubbl.us--on the English department blog. Mindmapping is perhaps a fancy way to say "outlining." But it's an exercise that many of us have used for our own work or taught to our classes as a way to begin a project. It can also be a useful brainstorming activity. I can see bubbl having a variety of pedagogical uses, both individually and collaboratively, both inside and outside the classroom. From teaching brainstorming in composition courses, to having students collaboratively trace the genealogy of the novel, to providing a graphic representation of intertexuality or patronage networks to accompany a lecture or in-class discussion, potential mapplications of bubbl abound. Finally, Shawn mentions two other mindmapping tools: Mindmeister and Mindomo as objects worth playing with if we were so inclined. I hadn't previously played with mindmapping tools but checked out bubbl.us immediately as it seemed to be something more exciting than revising the dissertation chapter I was working on. Using bubbl.us proved so easy and fun that I began using it to collaborate with Rachel Bowser on a conference panel proposal we had been kicking around. After spending some time with bubbl.us, I decided that I would check out Mindmeister and Mindomo as well. In the past week, I've made several different mindmaps in each of the tools, and I think I have a good grasp on the advantages and disadvantages of each of them. These are all useful tools that could be put to interesting use in the classroom, for group work, or for individual (student or professor) organization. They are all free (although two have subscription options) and are web-based so there is no need to install new software and your work is available wherever you can connect to the Internet. Generally speaking, Mindomo and Mindmeister are very similar to one another. They both organize materials in a tree structure. They're very orderly and allow you to collapse different elements of your tree to reduce the complexity of what you've built. And some of these maps can get very complex, as you can see from this mindmap of dermatology on Mindmeister made by Daniel Nygren. After playing with each of them extensively, I'd have to say that Mindomo is the definitely the more powerful of the two, but it also has a steeper learning curve. Mindmeister lacks some of the features of Mindomo, but the trade off might be worth it because its ease of use perhaps makes it more appropriate for the classroom. You can see example maps I made in both Mindomo and Mindmeister for people whom Rachel and I needed to contact about our call for papers. I could go on and on about the different advantages and disadvantages of the three different platforms (and you may think that I already have). But I've decided to use bubbl.us to summarize all of this for you. If that's a bit small for you to be able to browse the information effectively--and I suspect that it will be, although the zoom buttons in the upper left corner can help--then you can browse a full-sized version here. Unfortunately, you can't drag the bubbles around or start making new connections between things on my map. So I'll just recommend that you sign up for a bubbl.us account (or one of the others, if you prefer their looks) and start playing. Last fall, when ECIT taught the Technology, Literacy, and Curriculum (TLC) workshop in conjunction with the English department, I was asked to conduct some assessments of the course. I wasn't surprised that all the participants had learned new things and that they anticipated using the various technologies and techniques we discussed in their upcoming courses. But what did surprise me was out of all the subjects we covered in 16+ hours, the one that students found most appealing was the demonstration on how to give presentations from their iPods. This is an admittedly easy thing to do. Simply connect an Apple AV cable to your iPod and plug the other end into RCA connections on your TV. Then you can simply play a slide show or videos on the TV. No need to worry about PowerPoint or bringing a flash drive to class. (ECIT always recommends, by the way, that if possible you do bring a second copy of your presentation in a different format so you have a backup route for showing something.) You can now give a lecture with slides or video and not worry about any equipment besides your iPod, which most people always have with them. Of course, Apple was tricky with their cables. They changed the wiring inside the iPod so that if you used a regular RCA cables that come with, say, your digital camera or that cost less than $5 at an electronics store it wouldn't output correctly. However, if you played around long enough, you could eventually discover that if you plugged the red cable into the yellow jack, the yellow cable into the white jack, and the white cable into the red jack, you had a working solution. Even if you didn't want to play around, Apple's cables, which had the right color scheme only cost $20. All this changed last September, when Apple introduced the newest line of iPods: the Classic, Touch, and newest version of the Nano. Instead of outputting through the headphone jack with regular or Apple-branded RCA cables, to output your signal to TV all of these new iPods require you to have a cable or a dock with an Apple authentication chip. This chip is available in new cables that Apple has released and that plug, not into the headphone jack as on the 5th Generation iPod, but through the iPod dock connector. Importantly, the dock connector is, like the authentication chip, a design that Apple holds a patent on as opposed to headphone jacks. Okay, you say. That sounds less than ideal. How much will I have to pay for this magical iPod cable? Hear's the really egregious part: $50. Perhaps this isn't news. In fact, ilounge.com, one iPod enthusiast website, covered this subject two days after the most recent iPods were announced. But I came up against this problem last week when teaching a class on iPods and enhanced podcasts for postdocs in Emory's FIRST program. We had some trouble getting the TV out to work in part because I wasn't aware that the postdocs' iPod Classics used differently technology than the previous generation. One lesson to learn from this is to make sure you have tested all your technology before your class begins. It's never good to have the guy who is teaching you how to use an iPod be incapable of making it work. But the second lesson is that Apple has made it that much more difficult for us to use in the classroom what was the easiest and, according to the students, the best thing that we taught in TLC. Sure, I suppose you can say that we just need to go buy another cable. But the reality is that for graduate students $50 can be a significant cost. It's even significant if Emory or another institution is paying for the cables. Especially when one considers that 80 GB iPods cost $250, the purchase of the cable amounts to a 20% price increase in order to use an advertised feature of the iPod. Apple's made a name for itself for being the company the makes products you go just plug in and start working with, and ECIT has touted iPods for being a tool you can just plug in and start teaching with. It's too bad that plugging in costs you an extra $50 now. I'm continuing to work on my tutorial for building your own timelines. I'm getting very close to having a final version of something I think can be useful for even those who have no experience writing HTML. If you've been following my work on this topic at all over the last six months or so, you'll know that I will suggest you host your data within a Google Docs spreadsheet. Well, a recent update to Google Docs may make the whole process even easier than that which I have come up with for the moment. Set up your spreadsheet with the appropriately titled columns. Click on the gadget button that is in between the "Wrap text" and "Merge across" options. Scroll down and select "Timeline Gadget." You then have a number of options. You need to set the range of cells for the gadget to read. Then you can choose the units for the upper and lower bands (week, months, or years are the only choices). You can also set the width of these units and the background colors of the two different timeline bands. All in all, it's a very nice system. There's just one problem...I haven't been able to get it to work. I keep getting an error message that suggests that I haven't titled all my columns correctly. After spending all this time working with Timeline and its scripts, however, I'm pretty sure that I've got that part right. I'm pursuing help with the powers that be to see if I can figure out how to get this working. In any case, here's the part where I give you the positive and negatives to this approach and which will inevitably suggest that my chosen approach is particularly suited to what I want to achieve. On the plus side, it should be super easy to use. The gadget gets around your having to write an HTML side to a timeline. You can still share your spreadsheet with multiple people easily and thus have the database/wiki like feel to building and editing the timeline. Finally, the gadget includes an option that makes it easy to embed it in another web page or to include it in your iGoogle page. This means that you could build the timeline within a spreadsheet, but still place it within a page of your own design. The disadvantages at the moment include the inability to customize the timeline as much as you might want to. You only have three units of time to pick from. You also cannot use more than two bands in your timeline. The events cannot be color coded by type of event. There is no search box nor can you restrict events by one aspect or another. And you can only use particular column headers at the moment. This means that the information you can include in your timeline is limited. For these reason, I'm still a fan of the more robust timelines that I've been working with this year. That probably comes as no surprise to anyone. But there's at least one more option for you to use for now. You were probably getting tired of all my writing about Google. And it appears that this semester I've switched to being a big fan of Twitter. In any case, I just found an interesting new tool allows you to integrate your Google Calendar with your Twitter account. I'm not sure that I'm using Twitter more than I'm using Gmail at this point, but just in case I can now use Twittercal to blast appointments more effectively. Twitter Friends Network Browser: It's kind of like playing six degrees of separation, but with your Twitter family. twittervision: I mentioned this in my first post about Twitter. But that doesn't mean that it isn't fun to play with still. TweetStats: Get visualizations of how you've been using Twitter. Twitter Blocks: a Twitter-made application for visualizing your network and posts. 24 o'clocks: A very pretty way to browse your and your friends tweets on a calendar-like interface. And there will likely continue to be new applications designed using Twitter's API in the near future. I've been trying to explain to people for the last two months why I find Twitter intriguing. Maybe it's just because it's an easy web 2.0 platform or that it is very portable. It definitely has something to do with the pedagogical possibilities I'm imagining for it. But it also has something to do with the imagined communities that it is already allowing me to build. And that's enough for now. So I've seen things like this before, but I've never had the chance to play with one as it is developing. A new distributed fiction by Toby Litt has gone live today. The basic plot is that a teenage daughter who has been getting into trouble in California is taken out of her environment by her parents who suddenly move to England. The house they're in may or may not be haunted. We'll get to find out as things go along. You can follow the fiction by reading the blog of the daughter ("Slice") or of her parents. (Of course, the author have chosen age-appropriate domains for hosting the blog. You can also receive updates on Twitter (Slice and parents) and on Flickr. Finally, you can email Slice and interact with the characters that way. Credit to academicdave for pointing this out. Via Twitter. Of course. academhack/Dave Parry has a new post up on his use of Twitter. In it, he addresses the two reasons he teaches Twitter. In the first place, he sees it as an emergent medium that is shaping how we communicate and, thus, shaping our culture. In the second place, as he has written previously, Twitter allows him to expand the learning community of his students beyond the walls of the classroom and throughout the day. Given the more nomadic lives of our students, knowing what one another is doing and thinking about is a way to bring more interactivity into the classroom to foster community/communal learning. He is persuasive and although I'm a member of the choir to whom he may be preaching, I believe he's correct on both points. My own experience this past weekend using Twitter demonstrates the power of the smart mob/community that Twitter has put me in contact with. On Saturday afternoon, I learned from my wife that a tree had fallen on our house on Saturday afternoon in relation to the aftermath of Atlanta's tornado. I was waiting for Amber and the boys to come and pick me up at school, where I had spent most of the day when she called. Not having much to do, I decided to send out a tweet on the subject. Within a few hours, I had multiple people emailing to check on how our family was doing. Part of the distribution of the news was owed to my having integrated Twitter with Facebook. Some friends saw the tweet; others saw the updated Facebook status. But they more or less knew what was happening to me in real time. And they started offering to help in any way they could. In returning to academhack's post, the one thing that I would really like to highlight is a point that he buries to a degree. He suggests that the networks between students and professors who are using Twitter is similar to the networks one has to learn to form in order to be successful in graduate school. In thinking back on my graduate school experience to this point, I think that Twitter could have made bridging the gap between myself and our department's faculty even easier. I understand why not everyone wants to spend their time Twittering or sharing their private lives with whatever grad students may want to listen in. But the chance to get to know faculty members outside of the seminar room and their office hours are equally rare and valuable. Twitter is a tool that allows us to readjust and strengthen these relationships. And then to extend them laterally as we discover others who share our interests. When we don't all have travel/conference budgets to get out and meet all the people we would like to get to know, Twitter is a means for knowing what those whose work we are following in print are doing with their time. And it becomes the means to get to know them as well as or better than the people with whom you share an office wall. Good news to you timeline fanatics out there. The Victorian Age Timeline that JBJ and I built for his Victorian survey class is beginning to be populated with data. Check it out. Send us accolades and money. Timelines are not, I'm afraid, going to go viral in the near future. While I still don't think that building timelines will be all the rage, it appears that building tools to help others build timelines is. Today, I came across TimelineIt. Like Timefo, it's based on SIMILE's Timeline script and uses a simple forms interface to allow you to add events to a timeline that you can scroll through. Very smart inclusion of tabs that let you shift the scale of the timeline from days to weeks, months, or years. Zoom buttons let you get closer to events without changing the scale so radically. Look at the upper left and right, respectively, of this image, which is too large to host effectively on Blogger. You can use all the basic HTML coding that I use in my spreadsheets. 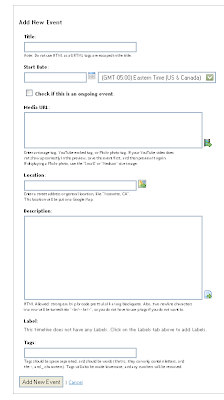 This means you can use it to create italics or links within item descriptions or to host YouTube videos. A much better name than "Timefo." Lack of tags means that you can't group events into types or relate them in any way. No way to build timelines as a group. No way to "publish" timelines. I'm unable to show my timeline to others unless I pull it up for them while logged in to my account. Dead-simple interface means no explanation of how to use the tool or how to take advantage of HTMLing things. No photos or video (without already knowing how the Timeline script works). No mapping (which Timefo does very well). Overall, I can't recommend TimelineIt at the moment over Timefo or xtimeline. It's got a very nice innovation as far as the tabs and zoom buttons go. But that's about it. Let's hope they take that innovation and move forward in other ways.